Why do many of the large, well known horse trailer manufacturers use mostly steel, and/or a combination of both? I believe the answer lies, not so much in benefits of one over the other, but in the history and development of the horse trailer industry itself. Back in the late seventies and early eighties, horse trailer manufacturers such as Sooner Trailers, Featherlite horse trailers, and Four Star horse trailers, began searching for alternate materials to replace steel since steel horse trailers were quickly deteriorating from rust. Since rusted horse trailers were generally everywhere horse trailer owners went, it didn't take much to convince consumers to switch to something better. After many materials were considered - Sooner and Merhow trailers had built some of their horse trailer models with a product called FRP (fiberglass-reinforced plywood). Others such as Bison Horse Trailers experimented with all fiberglass - aluminum was the ultimate chosen material, and all-aluminum trailers quickly grew. What horse owners didn't know were the negatives and dangers of using aluminum in the frame, sidewalls, floor and roof - that it was a more brittle material, would shear and tear when stressed beyond its capacity, and that it conducted heat. These negatives were not readily apparent, and the ability to research construction materials of horse trailers was not as easy as it is now. What most consumers basically did know about aluminum was that it didn't rust - and that seemed to be enough. One of the negatives that was apparent to the manufacturers, and worried them, was the high cost of aluminum. However, the high costs eventually worked in their favor - the market was ready to spend more for a supposedly better product, and the high cost gave consumers the impression that it was a superior trailer. It costs a lot more therefore, it must be better. 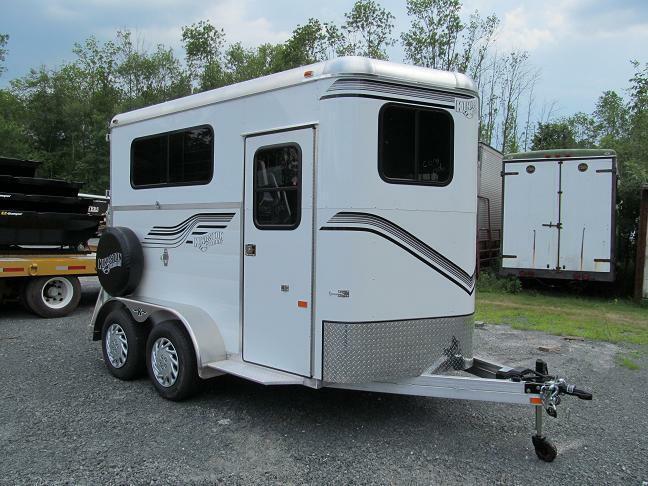 Once the "all-aluminum" horse trailers hit the market full force, the market quickly perceived that the all-aluminum trailer was a high quality, premium product. Therefore, horse trailers such as the models built by Sooner trailer manufacturing, Featherlite trailers, and Four Star trailers were perceived as being top of the line, not realizing that the extra expense was directly attributed to the higher cost of aluminum, not necessarily, because it was a better product.Because of this consumer perception, combined with the rapid market acceptance of the all-aluminum trailer, and the alternative being rusting steel, many existing manufacturers switched over to aluminium, such as Sundowner, Merhow, Cherokee, and Bison. Through the years, many new start ups opted to build all-aluminum horse trailers such as Exiss, Eby, Adam, and Gore for the same reasons. Of course, it is true that all-aluminum trailers are not equal - some are better than others are. Companies such as Sooner, Featherlite, Exiss, and Four Star will vary in quality and design according to the company's construction and design philosophy. The real issues to look at are the problems inherent in the aluminum material itself. Pound for pound, aluminum used in most horse trailers is only 1/3 the strength of steel, so when it is used in the frame, this has to be taken into account. Manufacturers often have to boost the amount of aluminum used in the horse trailer floor and frame to get the equal strength of a steel frame. This is why some of your better "all-aluminum horse trailers, such as 4 Star, will be the same weight, or sometimes heavier as a similar model steel built trailer. Where aluminum often fails the consumer and their horses is in the interior dividers. Since aluminum is weaker by about a 1/3 from that of an "equal in size" steel divider, it will fail quicker under stress. When aluminum fails, it shears and tears. We have a Featherlite 9440, year model 2000. This eighteen year old trailer shows no signs of age, despite tens of thousands of miles hauling horses. We used to pull steel trailers that were rust buckets in less than ten years. Article by Double D trailers, a manufacturer of steel trailers. Thanks, but I'll stick with all aluminum.